El Rojito / Refill It! That daily latte habit is bad for more than just your wallet. It’s also pretty terrible for the environment, unless you’re dedicated to bringing your own cup. Starbucks alone sells about 4 billion cups a year, and although the company has been working to make its cups recyclable, many coffee cups can’t be composted or recycled due to plastic linings. In Germany, about 2.8 billion to-go cups go right into the trash annually. Coffee shops in Hamburg, Germany, are trying to combat the scourge of coffee trash by introducing a reusable cup program across cafes in the city, as CityLab reports. The Refill It! 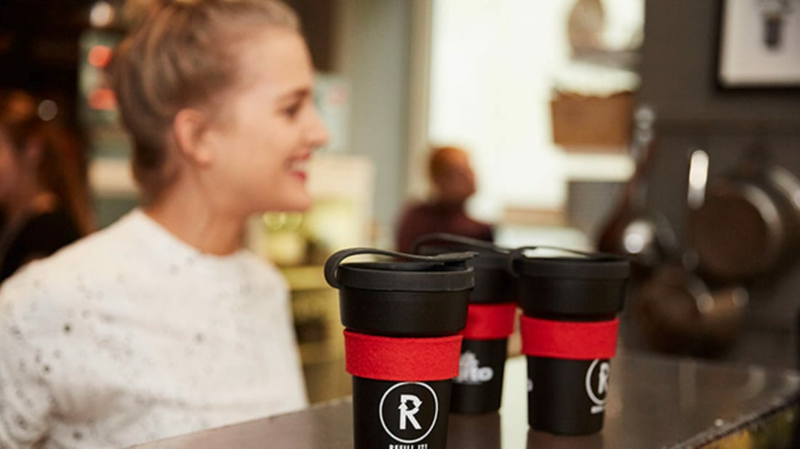 cup, created by the local coffee importer El Rojito, can be acquired at participating retailers for a deposit of just €1.50 (around $1.60). You can keep the cup if you want, refilling it at other coffee shops, or you can return it and get your deposit back at one of the participating cafes. That cafe will then wash out the reusable cup and allow someone else to take it. If you’re super worried about germs, you can purchase your own lid and felt sleeve. The project started operating within 11 different coffee shops around the city on November 1. Even if you don’t live in Hamburg, you can still do your part to save landfills from disposable coffee cups. Most cafes will happily make your drink in any reusable mug you bring, and many will give you a small discount for your trouble. If you’re not a fan of the tall thermos-style mug, KeepCup makes neat cups, shaped just like the one you’d get at the coffee shop, in plastic or glass.